Yesterday I was shooting the presentation of the 2013 Prime Ministers Pacific Youth Awards in the Banquet Hall at Parliament. I had to take two different styles of shots. During the ceremony this involved recording the presentation and speakers on stage. Then at the end I had to get group shots of the winners, sponsors and the Minister. Normally this would also involve the Prime Minister but this year he was absent due to the Nelson Mandela funeral in South Africa. Now the things about any photograph involving politicians and particular Ministers is that there day is timed to the minute and therefore you do have the time to muck around. This is especially so if you need to grab some shots at the end of a function that is likely to run behind schedule. The key to this is planning. Having shot in the venue before I know that it is not one to let the camera control the setting. The stage is always set against the outer wall of the room which contains floor to ceiling windows. Basically this amount of back light is going to completely fool any in built meters. The other things was to remember that these images were intended to simply record the event. They were not intended to be award winning images where lighting is paramount. Rather the lighting had to a balance between being strong enough to illuminate the people but at the same time not harsh enough to make then look bad. 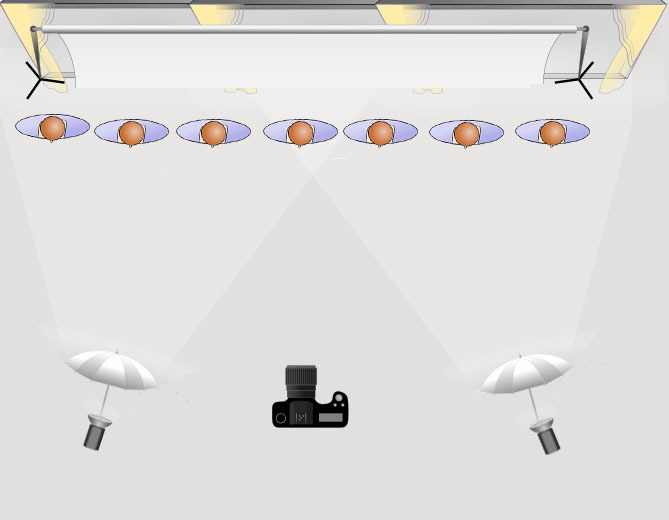 I arrived at the venue well before the start and set up two lights fitted with shoot-through umbrellas as shown in the diagram below. I used shoot through umbrellas because I knew that this would give a reasonable spread in the light, as well being extremely portable. What I needed to factor in was the differences in the power of the lights that would fall on each of the party particularly those in the middle and those standing closest to the lights. This is something that you can really only work out effectively with a light meter. I took a reading in the middle with my shutter speed at 1/100s and ISO 100 and came up with f9. I then went to the point where the person closest to the lights would be and repeated the process. This time I got f10 which was really pleasing because it meant that there was only a third of stop difference in the positions. I would have accepted anything up to a full stop of difference knowing that I could compensate for that in post. As it is best to shoot more towards the right, f9 would be my choice for the setting. Sure enough a couple of speakers ran long and the session finished slightly behind schedule so I was pushed to get in all the shots before the Minister had to depart. The shot below is the end result. 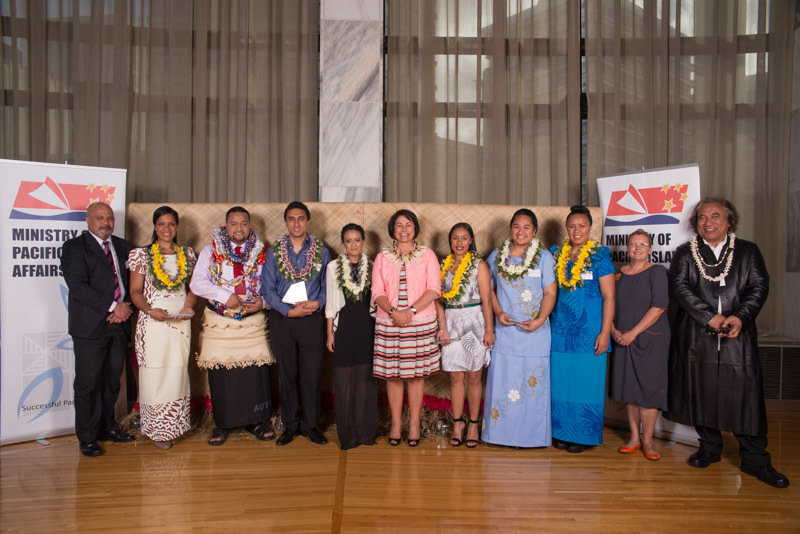 Minister of Pacific Island Affairs Hon Hekia Parata, the seven winners of the 2013 awards and three of the sponsors of the awards.